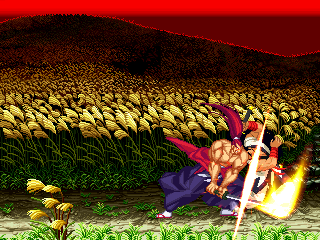 Working on Genjuro from Samurai Shodown in Jmorphman's CvS-ish system. - Moveset from Samurai Shodown V Special, the best Samurai Shodown game. 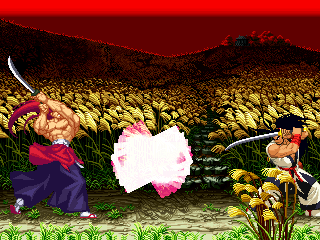 - Accurate hitboxes from Samurai Shodown V Special. 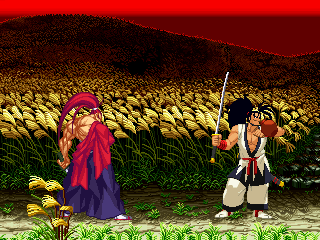 - Fame data adjusted to CvS standards by comparing Haohmaru and Nakoruru. - A character that should feel right for both CvS2 and SSVSP players. I've been toying around with Fighter Factory for about one year now. Started this project ten days ago. This is my first character and I'm learning a lot stuff on the get go. I would like to thank people from MUGEN.NET and Cyanide, Bannana, and Vans for helping me out when in trouble. Also Jmorphman for both the template and helping. - Slash FX for Shizuku Jin and Hyakki Satsu. - Adjust all specials damage. - Adjust all specials frame data. - Adjust Touha Houyoku Jin velocities. - Adjust Ouka Zan velocities. - Fix a bug with Ouka Zan. - Fix throw p2 velocities for both specials and normals. - Add some cancels for comboing. - Voices (still diciding which voice I'm gonna use. Would like to wait for the release of the new game for this). - Crouching Guard Crush & Jumping Guard Crush. I still don't know how to do a palette template but I'll look in to it later and post the result here to get some palettes. Ooooh. Nice FX on the Slash Moves. Third: why not using Dampir's CvS sheet, if you're with a Jmorphman's style? (just a suggestion, not a request). PS: And also a cool user portrait. Touch-a touch-a touch-a touch me / I wanna be dirty! Chill me, thrill me, fulfill me / Creature of the night! I prefer SSV sprites, they're more consistent. Also cool user portrait too. hey! Glad to see you're making progress with him! when you're ready for beta testing I will gladly continue to help you with this. 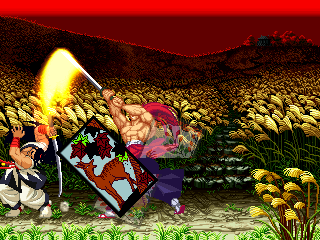 more SamSho chars are always welcome. holy crap! nice! one of my favs from ss! One of my dream characters for mugen. I wish you good luck in your endeavours - Genjuro looks good so far. I would like the samurai spirits chars could be more valorized in CVS style, Charlotte,jubei and ukyo can be great in this style.